The 10 Best Boat Rentals in South Carolina! South Carolina plays home to 23 lakes and more than 40 rivers, not to mention the Atlantic Ocean and adjoining waterways. Which means there are plenty of places to hop aboard a boat and set sail for adventure. Grab your sunglasses and reserve your watercraft at these 10 best places to rent a boat in South Carolina! With two locations on Lake Murray, you can find whatever type of boat you need, whether it’s for a few hours or a whole day. Fans love how clean and well-maintained the rentals are here. You have your pick of pontoons, ski boats, pedal boats, kayaks, or Boston whalers. Murrells Inlet is a prime destination for fishermen and nature lovers alike, so it only makes sense to have an amazing boat rental company to cater to their needs. Located at the Wacca Wache Marina on the Waccamaw River, you can rent a variety of pontoon, fishing boats, bow riders, kayaks, and paddleboards for a half day, full day, or your entire vacation. If your vacation rental has a dock, they’ll even deliver your boat to you for free. Set your sights on adventure and head to Myrtle Beach Watersports for jet ski and pontoon boat rentals. If you feel like playing captain for the day, you can book your group on a jet ski dolphin tour, dolphin cruise, guided adventure, or pirate ship excursion. This marina is nothing short of an enjoyable experience, even if you aren’t renting a boat. With beautiful lake views and an on-site market and restaurant, you could spend the afternoon on shore and consider it a good day. But you’ve also got your choice of bow riders and center console boats to take you far and away. You can also book a fishing charter and let the professionals show you where the good fish are hiding. A relaxing day on the lake is anything but if you have a bad experience before you ever leave the dock. Which is why locals and tourists alike love Jocassee Keowee Rentals. From the moment they arrive until the time they’re back on dry land, their customers agree that the entire experience with the staff and watercraft is nothing short of excellent. If you want to explore the surrounding waterways on your own, this boat rental locale offers a variety of different sized boats to fit your group. Head to one of the barrier islands for a picnic, cast your line to see what bites, or simply relax and soak up some sun. They also offer planned excursion and water sports activities, such as banana boats, wakeboarding and tubing, parasailing, and more. Situated on beautiful Lake Keowee, this marina offers just about any type of watercraft you need for a day of fun in the sun. 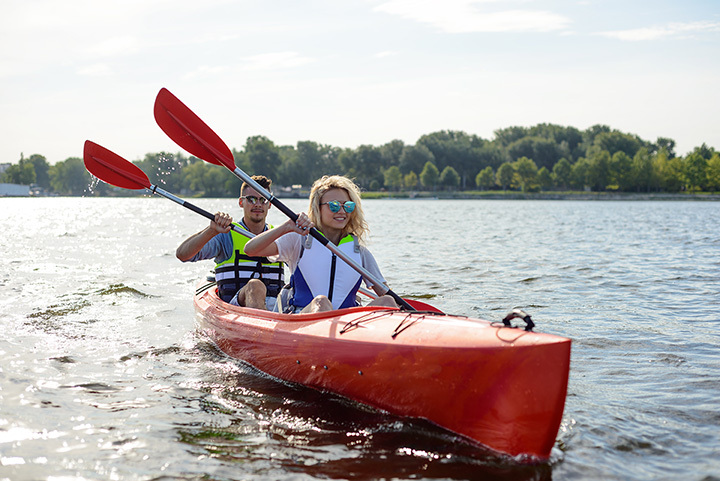 From pontoon and wake boats to canoes, kayaks and paddleboards, you can entertain your entire group or embark on a romantic lake cruise for two. One of the biggest benefits of this rental company is their location. It’s the perfect spot for those just learning how to jet ski, with its calm waters in a cove that’s tucked away from the open water of Lake Murray. However, it’s a short trip to other locales in Lake Murray, such as Dreher Island. From boat storage to boat rentals, the folks at Lighthouse Marina understand boaters’ needs and deliver on all points. Here you can rent a pontoon for an hour or a day, and get all the expertise and guidance you need to make the most of your day on Lake Murray. Deriving its name from its location where the Reedy and Saluda rivers meet to flow into Lake Greenwood, this rental spot offers pontoons, paddleboards, and kayaks for your convenience. They also offer on-site accommodations so you can make an entire weekend out of your visit to Lake Greenwood.